The operas of Richard Strauss are fertile ground for such works and indeed Strauss sanctioned such works where he was not directly involved in their creation. 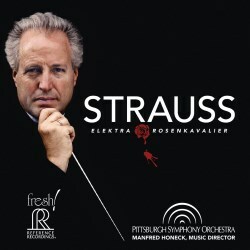 This disc is a very effective and impressive coupling of the familiar 1944 Suite from Der Rosenkavalier, created by the conductor Artur Rodzinski, and a new “Symphonic Drama” compiled by conductor Manfred Honeck in collaboration with Czech composer Tomáš Ille taken from the opera that immediately preceded that; Elektra. Important to say straight away - whether one responds to this kind of orchestral traversal or not - these are pretty stunning performances recorded in demonstration sound. Honeck's background as a violinist in the Vienna Philharmonic before picking up the baton means that he is perfectly attuned to the Straussian operatic idiom and he gets the excellent Pittsburgh Symphony Orchestra to play with an ideal combination of supple richness and thrilling attack. The Reference Recording matches the quality of the playing never being overwhelmed by the sheer scale of the music presented. The Suite from Elektra is offered first. Curiously - and I think this is a mistake - Reference present this as a single near thirty four minute track. Honeck, in his conversational liner note, gives a very useful and detailed breakdown of exactly which part of the opera he has selected and where they occur. Quite why Reference did not see fit to allocate a new track to these cues I do not know. Ille's work constructing a logical musical flow out of the musical sequence which is not always strictly chronological is brilliant, as is his re-orchestration of the score down from the gargantuan demands of the original to the still-expansive requirements of this concert suite. There are moments when transitions have occurred and you only realise after the event that they have happened. My only observation - and this is has been my reaction each time I have listened to the work - is that this is a rather exhausting experience. Elektra is never exactly an easy listen - and somehow this distillation down to thirty minutes from around one hundred makes it even more of an musical pressure cooker than ever. At the same time there is a loss in the dramatic arc of the work - the pacing of the piece is radically altered - ultimately detrimentally so. Of course the same could be said of the Rosenkavalier traversal or any similar treatment. But the trade-off with Rosenkavalier is that the mood of the work weighs less oppressively on the listener and also there are more out and out 'tunes' that survive being filleted out from the larger work. Honeck rightly points out that Elektra is the most symphonic of Strauss' operatic scores and certainly this condensed survey of the score reinforces the sense of thematic inter-relationships. So ultimately, despite my penchant for this kind of orchestral treatment and for all the excellence of this performance, I suspect I will not be returning to this recording very often. On the occasions I want to hear the obsessive expressionist maelstrom that is Elektra, I will go for the complete work. I realise that I have much the same reaction to the more common Symphonic fantasy Strauss himself assembled from Die Frau ohne Schatten. Strauss did select highlights from Der Rosenkavalier in the form of two waltz sequences and Honeck has recorded these before - quite superbly - on Berlin classics with the Bamberg Symphony Orchestra. Much of the material is different from that Rodzinski compilation but it is interesting to see how Honeck's approach has changed in the intervening thirteen or so years. The fact is, very little - Honeck seems to like extremes of tempo - a very bustling dramatic opening and a willingness to linger lovingly in the more lyrical passages. The sense of affection and engagement is very strong and this suite gets an excellent performance. As recorded, the athletic and highly articulate Pittsburgh strings cannot produce quite the weight of saturated tone that their Viennese compatriots can for say either Previn or Thielemann, both on DG, but the Reference recording is far superior to either. There is a fine old performance from Charles Gerhardt and the (nominal) RCA Symphony Orchestra as well as more recent performances that get close to Honeck either as recordings - Jesús López-Cobos in Cincinatti on Telarc - or performances - Christoph Eschenbach with the Houston Symphony Orchestra on RCA. But for a combination of recorded technical excellence and musical empathy and skill I do not think Honeck has been bettered. Yes I know the famous trio is even better when sung but as played here the effect is of disarming tenderness and emotional release. The liner is exemplary - I am not always keen on the conversational format that is employed here but Honeck is clearly deeply engaged with this project and his passion and sincerity shine through. The recordings were made live but there is no audible compromise at all - the orchestral playing is incredibly assured and error-free and with no applause retained the audience is completely inaudible.